Buy your Shoei J-Cruise Helmet at Champion Helmets and get: ✓Best price ✓Free shipping ✓5% Cashback on your Order Value ✓Super Fast delivery ✓Order now! 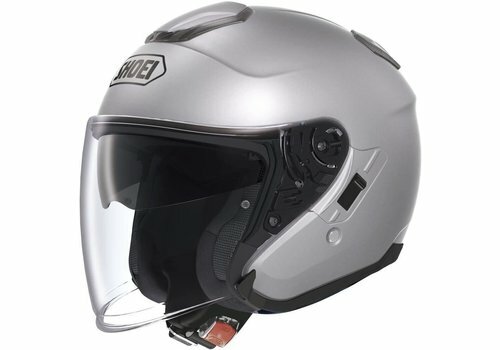 The Shoei J-Cruise helmet is the successor to the popular J-Wing helmet. The J-Cruise is a jet helmet that is perfect for daily use, especially because of the optimal wearing comfort. The long visor provides an extremely wide view and covers the entire face. It is the first Open face helmet with an internal sun visor that is certified as sunglasses according to European guidelines. In order not to compromise on safety, they have not made the EPS inner shell thinner, but the outer shell has been raised to accommodate the internal sun shield. 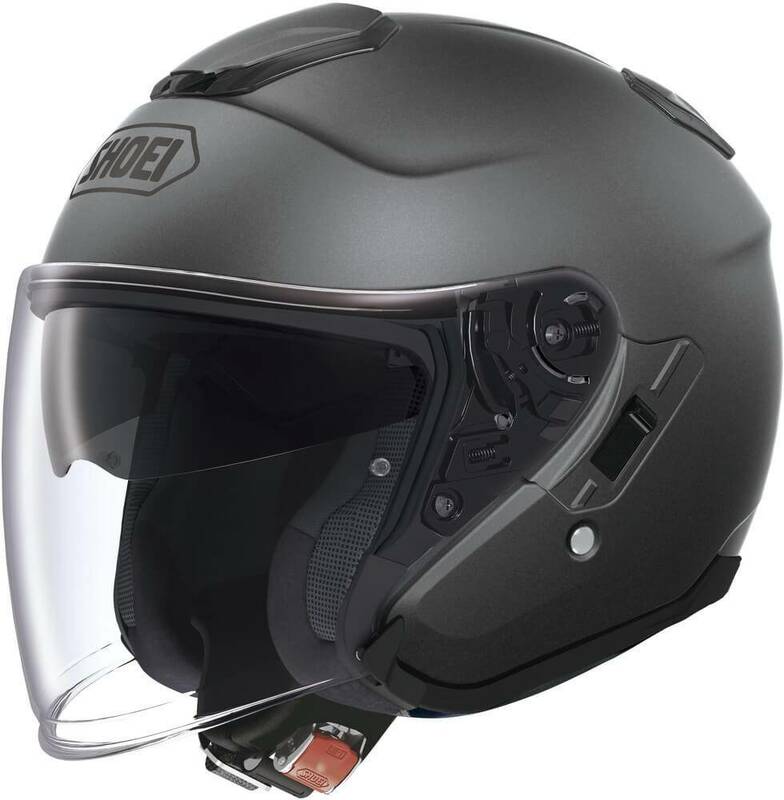 As expected from Shoei, this is a Top quality helmet with an AIM shell and an EPS inner shell with different densities for superior impact absorption. The outer shell comes in 3 different sizes for a perfect helmet fit. Moreover, the helmet is very compact thanks to the several outer shell sizes. The helmet is prepared for the communication system SENA 10U. 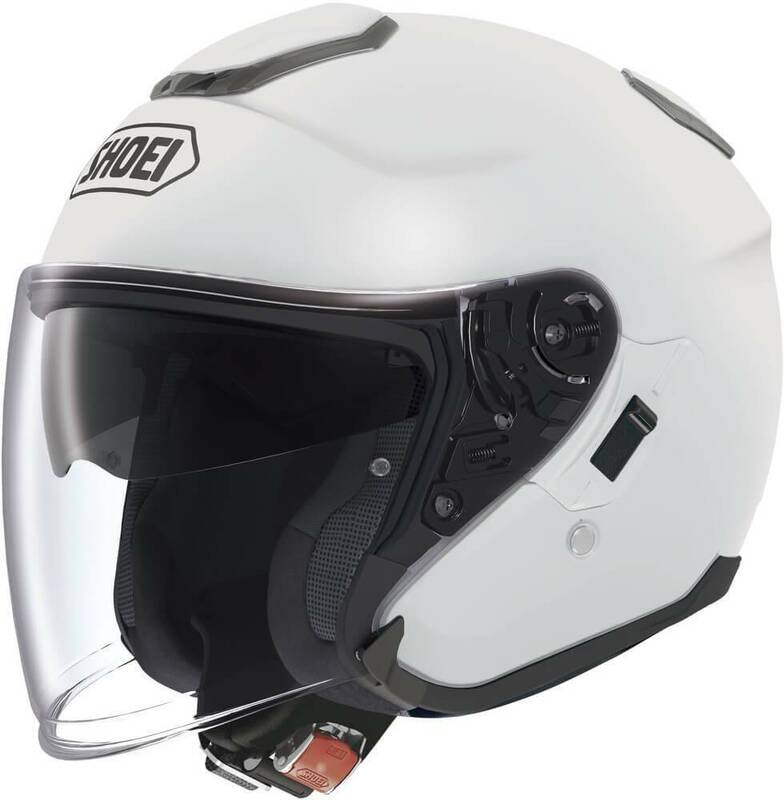 A competitor of the Shoei J-Cruise is the Schuberth M1 Pro. 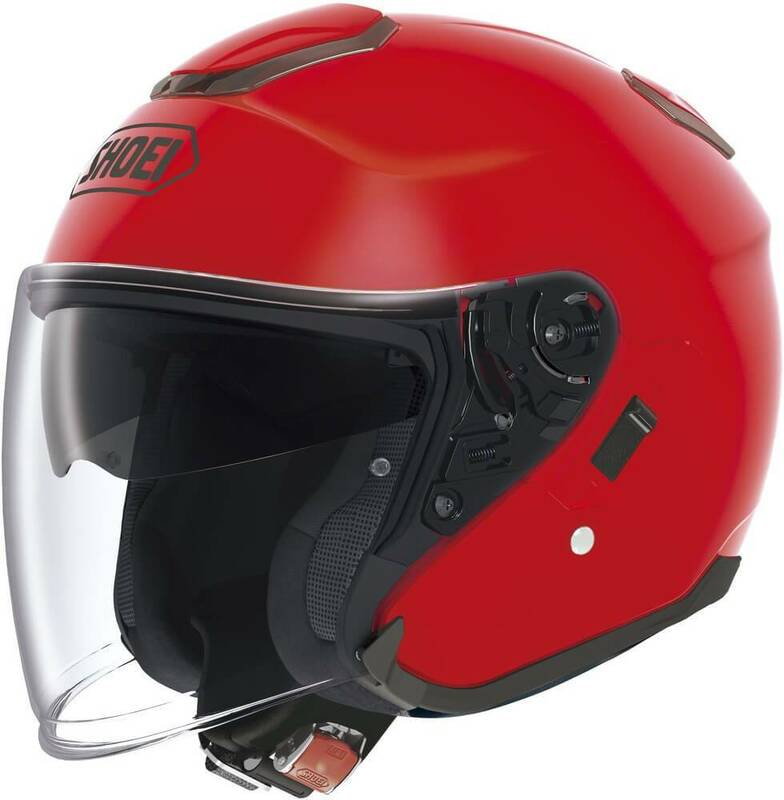 This is also a premium jet helmet with a light DFP (Direct Fiber Processing) fiberglass shell. It has excellent ventilation, an integrated sun visor and is prepared for a communication system with pre-installed microphone and speaker. The recommended retail price of the M1 Pro is starting from € 439.95. 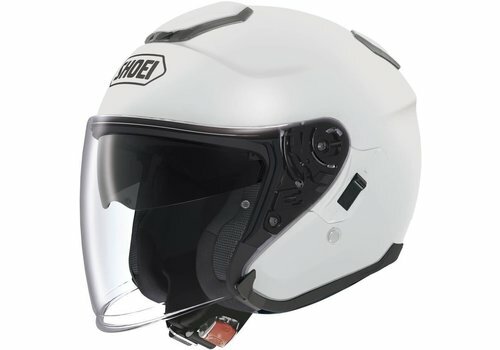 The Arai SZ-R Vas is also a competitor of the Shoei J-Cruise. The helmet shell consists of the characteristic super fibre layers of Arai, with a sticking fibre mat between them. In addition, this super strong material has a low weight. This helmet is also equipped with excellent ventilation that is copied from the RX-7V. Furthermore, this helmet is prepared for an external sun visor and a communication system, for which there are speaker bags in the lining. 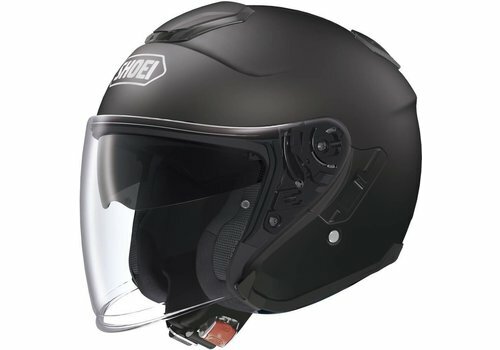 This helmet has a recommended retail price starting from € 599. These helmets are available at Champion Helmets for an excellent price. For an extra discount you can subscribe to our newsletter or You tube channel and directly receive a free 1000 points Champion Cash worth of € 10,-. Found it cheaper somewhere else? Pass it on to us and we will price match and even try to beat the price. The Advanced Integrated Matrix shell consists of several layers of high-quality composite and organic fibres. The combination of these materials gives this outer shell a shock resistant capacity and optimum rigidity. Another characteristic of this combination of materials is the low weight of about 1350 grams. This motorcycle helmet is equipped with a micro ratchet closure. This micro ratchet closure is an easy to handle, adjustable, stainless steel closure. The J-Cruise has an aerodynamic shell with an integrated spoiler. Furthermore, this helmet has been tested in the Shoei wind tunnels, making it a very stable helmet. 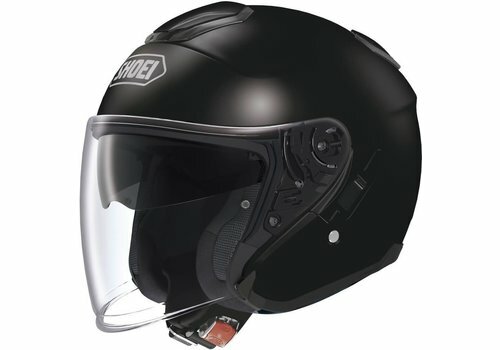 The top ventilation system of this jet helmet is similar to that of the GT AIR 2, it offers optimal comfort. 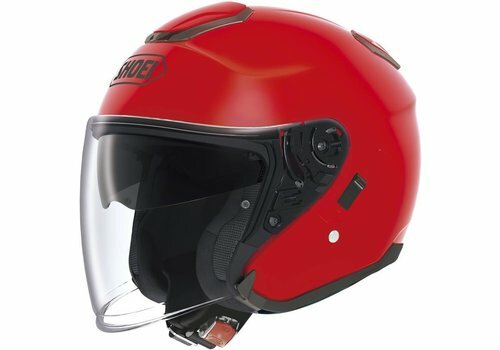 There are two large adjustable upper vents on top of the helmet and two lockable air outlets on the back of the helmet and an outlet in the neck. 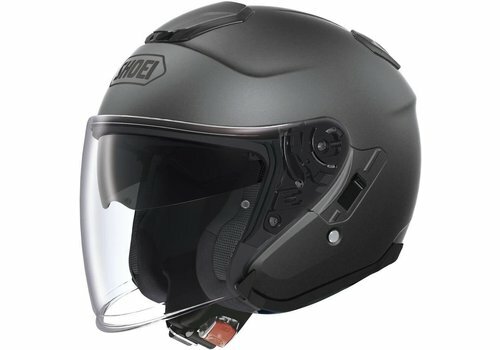 If the two rear air outlets are open, warm air is sucked out of the helmet. 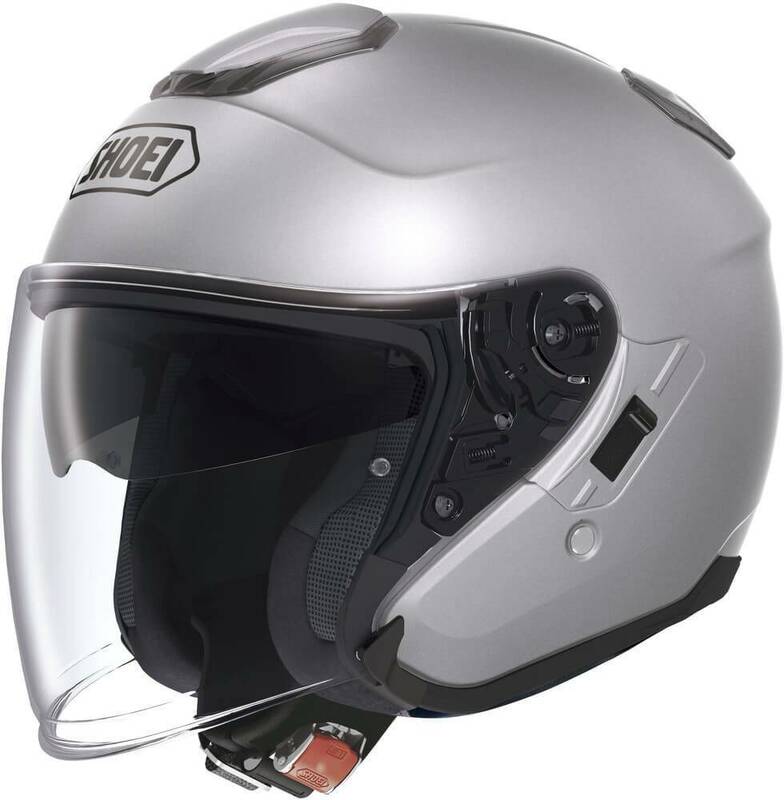 The internal air channels are very cleverly developed, giving maximum airflow in the helmet. 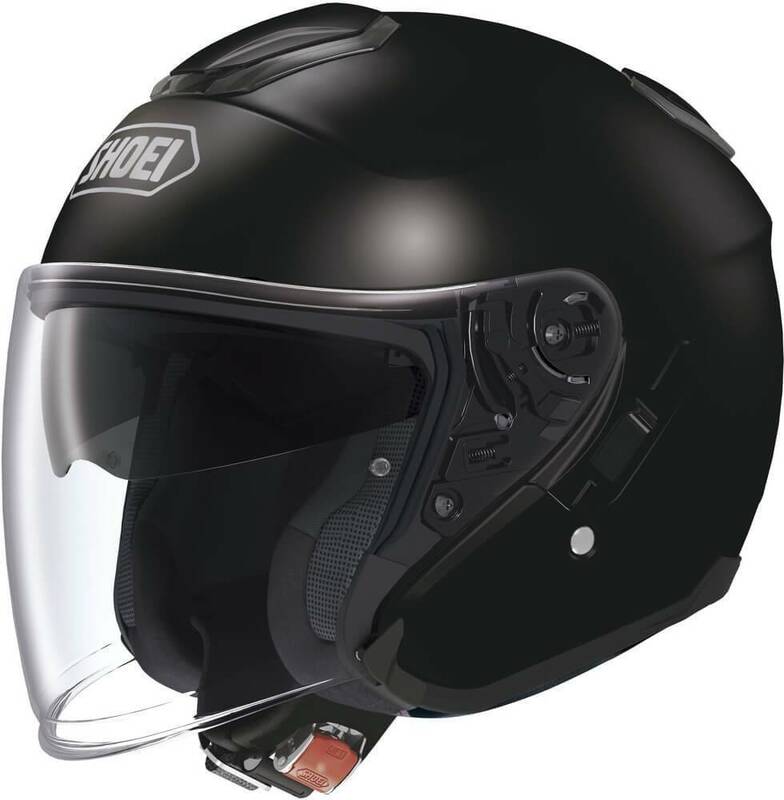 The Pinlock ready CJ-2 visor with a wide open view, has an outward facing edge at the bottom end of the visor, preventing wind noise and wind turbulence from entering into the helmet. The visor is equipped with a secure locking system on the side. At the top the visor closes watertight. Furthermore, the visor is prepared for a Pinlock anti-fog lens and has been treated with a scratch resistant coating. The internal sun visor (QSV-1) has been tested according to the DIN EN 1836 standard. The 3D Max Dry interior liner is fully removable, washable, antibacterial and moisture wicking. This lining absorbs moisture very quickly and carries it off. Sweat or no sweat the lining feels nice, dry and comfortable. The lining also includes ear pads to reduce noise. They can also be replaced by the speakers of a communication system. The cheek pads are available in different thicknesses and they fit into the different helmet sizes. So you can adjust the thickness of the cheek pads to your personal preference, depending on the shape of your face.